Recently, panelists Jordan Bettman of Bain Capital Ventures, Eliot Durbin of BOLDstart Ventures, Spencer Lazar of General Catalyst, Micah Rosenbloom of Founder Collective, and Adam Rothenberg of BoxGroup, discussed the past and upcoming trends in the world of startup investments and technology, with Orrick’s David Concannon moderating. The first topic was a broad one, asking about what industries or products or markets are currently worth investing in. Lazar said that General Catalyst is looking at software marketplaces, specifically businesses that are run through their platforms. The market for home services and products in particular is growing. Next topic: which trends shouldn’t be pursued at this point. Rosenbloom stated that an investment opportunity can arise from anywhere (such as driverless cars) and as a result, he’s more interested in original ideas than slight variations on a pre-existing product or service. He also said that hardware is very hot right now, and the ecommerce sector has gone somewhat cold. People want to see a physical product, and be able to feel or play with it. Rothenberg said the shipping and logistics sector has big opportunity and potential, along with apps built for specific purposes, like Uber and Handybook. Bettman spoke in detail about Bitcoin in particular, saying that it is very interesting at the moment, since it is the first time in a while that people have been vehemently arguing about something in tech, on both ends of the spectrum. It’s becoming more than just an online currency: people are using it for legitimate transactions, such as real estate titles and stock. It has a very large potential to either grow or fail greatly, and it will most likely be regulated at some point in the near future. He also gave a bit of advice for budding entrepreneurs, saying that investors are most interested in the size of your market and your team dynamics. As an entrepreneur, you must think about the business you are building, and why you are the best person to run it. Durbin recalled his experience investing in IndieGoGo and its success, labeling it as a metaphor for taking the right opportunity when it came up. IndieGoGo’s appeal was its fast growth, along with how it differentiated itself from Kickstarter. Three startups gave demonstrations after the panel discussion, companies that were brought to present by each panel member who invested in them. The first company was niche, a “hub for emerging creators” which unifies social media profiles for popular content producers. It uses cross platform analytics and large corporate brands to advertise through social channels, and works with some of the top people on Vine and Instagram. The next company was Fertility Authority, a comprehensive, interactive online network for women — and men — seeking fertility and infertility information, advice, referrals and appointments. The final company to present was Persados, a marketing startup focusing on modifications in terms of the language used in online ads. They focus on the variation of messages in marketing, and help to figure out the best way to present a company’s message. 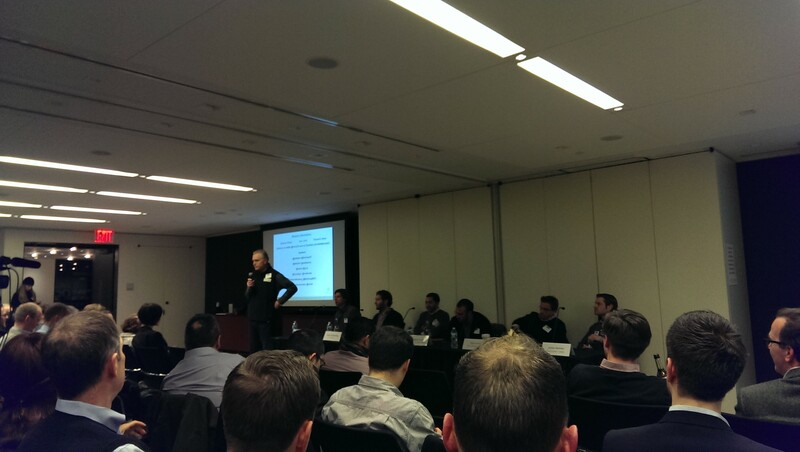 The panel presented a very insightful look into the thought processes of investors. Lazar summed it up perfectly when he said that he’s an investor because he’s motivated by what’s next and by the tension surrounding the decisions he makes.